Trencher attachments for skid steers and compact track loaders are the perfect tools for operators who need to slice through the dirt with precision and ease. They help everyone from contractors and landscapers to maintenance crews and municipalities dig trenches for installing irrigation systems, power and water lines and even performing road repairs or general construction tasks. But before you hop over to an equipment dealer to buy one, it’s important to know where to start so you get the right tool for your small tool carrier. 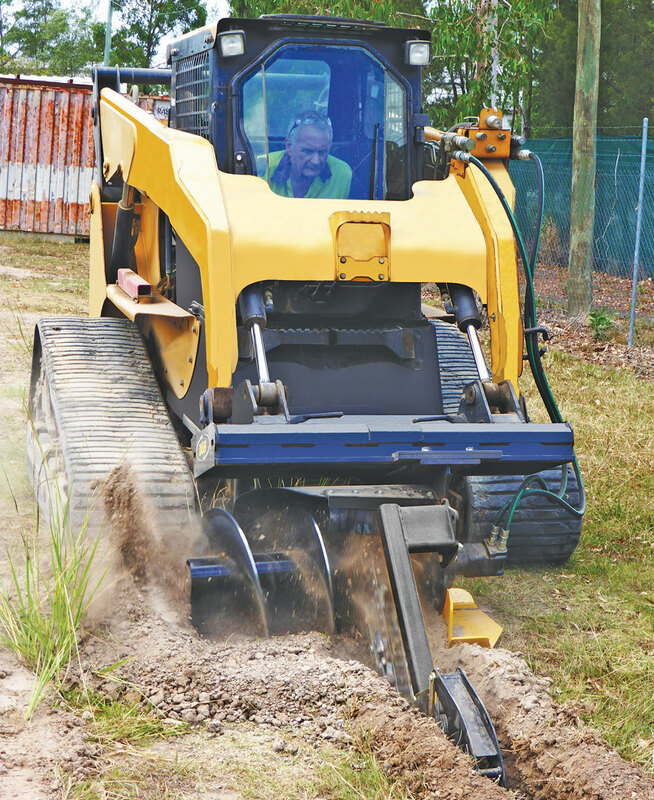 To determine the proper hydraulic flow, Gregg Zupancic, product marketing manager of skid steers and compact track loaders for John Deere Construction and Forestry says operators should consider the maximum depth of trench they will need. For example, a 3- or 4-ft trencher can typically be powered by a standard hydraulic system whereas a 5-ft or larger trencher will likely need to be powered by a high-flow hydraulic option. Aside from the hydraulic flow, Doug Amerman, regional sales manager for Digga North America, says operators should consider features such as precision depth control design to assist the operator in consistent trench depths and a crumber bar design that allows for a cleaner trench. There are a ton of different chain widths and teeth configurations too. Operators will need to identify their specific applications and ground conditions before selecting the best type of chain and teeth for the job. Standard single chains are recommended for use in loose, damp soil and are generally used on smaller trenchers with 6-in. digging widths. The dirt cup teeth are typically spread out on alternating sides of every other link. Dirt cup teeth are designed to cut into the soil and carry the dirt up and out of the trench to the auger that places it to one side of the trench. Double standard chains are the most popular style and recommended for use in harder, drier soil. These chains feature about twice the number of dirt cup teeth as a standard chain and tooth configuration. These are the most common since they perform well in both hard and soft soils. Half rock and frost chains are heavier-duty chains recommended for hard, frozen or mixed rocky soil conditions. These chains feature tough conical carbide rock teeth that rigorously cut away at the rocky soil. The configuration along the chain is typically dirt cup teeth alternating with rock teeth at various widths. This pattern chips away at the rocky soil in numerous places for the greatest penetration, while the dirt cup teeth carry the fragments and soil up and out of the trench. As with any specialty attachment, operators will have to make the decision whether to rent or buy a trencher. The decision ultimately depends on how often the operator will expect to use it. Smaller trenchers typically start in the $4,000 to $5000 price range, with larger ones selling for $5,000 to $8,000. Zupancic points out that other features like chain options and teeth configurations can add some additional costs. Never trench before marking buried utility service lines. Bystanders must be at least 20 ft away from the machine. Operate only from inside the cab of the skid steer or track loader. Avoid steep terrain that would possibly cause an overturned machine. Trencher attachments are heavy — travel only in a safe transport position. Do not drive close to ditches and excavations that could cause a cave-in. Do not attempt to trench in a tight curve, or damage will occur to the trencher boom. Always stop the machine and remove the key before working on the trencher chain, teeth or any part of the attachment. A mini skid steer equipped with a microtrencher attachment is the ideal solution for installing fiber-optic cable in confined urban areas. It improves productivity, cuts fiber cost per foot and reduces ground disruption. Compared to jackhammers and backhoes, this attachment can more precisely excavate a utility under roadways — making utility maintenance more cost-effective and less disruptive. It can also be useful for turning corners on fiber jobs. Rather than using a backhoe or crane to remove large areas of concrete, this attachment can lift nearly 4 sq ft of concrete depending on the unit’s operating capacity. A rock hammer or breaker attachment is the optimal tool for quickly fragmenting concrete, asphalt pavement and rock. 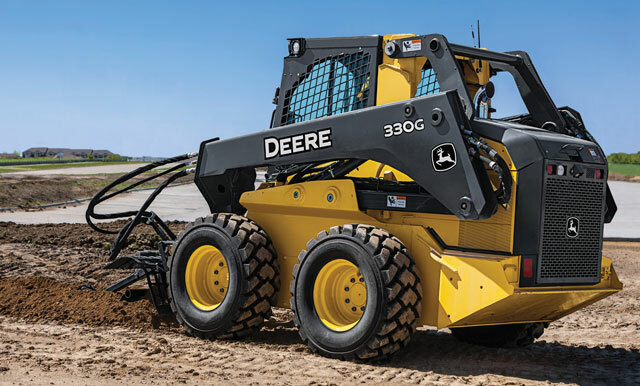 It frees operators from the jolting effects of jackhammering, allowing a compact mini skid steer to conquer the job. 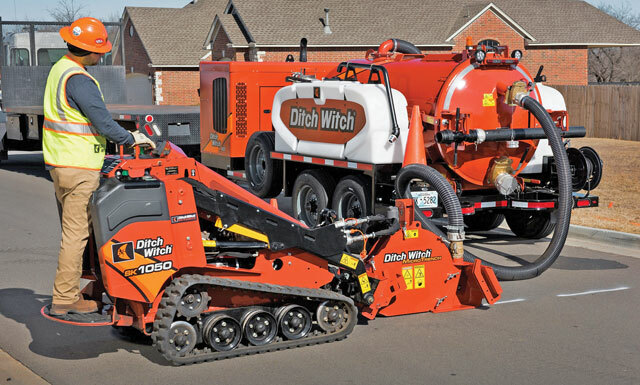 On urban projects, sweeper attachments make cleanup quick and effective. Rather than using a broom, operators can attach the sweeper to the mini skid steer used for coring or microtrenching and scoop everything into a bucket for disposal. Check out more trenchers here.